WITH ONE PURCHASED PROJECT ONLY ONE HOUSE CAN BE BUILD. 1.1 These terms and conditions govern the rights and obligations of the buyer and the company EUROLINE SLOVAKIA spol. s.r.o. , With headquarter on Vajnorská 17 / A, 831 04 Bratislava, which is registered in the Commercial Register of the District Court Bratislava 1, Section: Sro, File No: 9535 / B, ID: 31401848, VAT No: 2020322645, VAT ID: SK2020322645, tel. +421 2 4445 8549, 0800 135 955, email: info@eurolineslovakia.sk, web site: www.eurolineslovakia.sk, (hereinafter referred to as "Seller") and are valid for the whole area of the Slovak Republic. 1.3 Project documentation is intended for area management for building permit and for construction. Representation of a house in the catalog (visualization) is illustrative and may not correspond to the completed building according to the project documentation. Project documentation does not include furnishings and movable assets situated in visualization. Seller reserves the right for minor technical modifications in implementing projects against the proposal referred in the web sites and printed catalog, while the concept remains the same proposal. a) Project of an architectural - construction solution, comprising: a comprehensive technical report, drawings (scale 1:50 and 1: 100): Foundations, floor plans, cross-sections, roof plan, views, details and compositions of floors, windows, doors, masonry blocks, roof coverings. b) Project fire safety solutions, comprising: a technical report and drawings (in scale 1: 100). c) The structural analysis project includes: technical report, static calculation, ceiling composition drawings, drawings of reinforcement, floor slabs, wreaths, lintels and stairways and a material report. d) Heating project includes: a technical report, calculation of the energy consumption for heating, drawings of heating installations, wiring diagram, location and dimensions of heating elements and material report. e) Sanitary installations project includes: Technical report, internal water supply drawings, home sewage system, domestic gas distributions and material report. f) Electrical wiring project includes: Technical report, distributors for power points and light electrical installation, weak current scheme, switchboards, lightning and material report. g) Itemized budget and bill of quantities. Itemized budget, which is in the case of an order of the complete sample project for free, is detailed in the "Architecture" and "Static" and approximated in various professions. 1.6 Project documentation does not include specific house settings to the surroundings and the connection to the communications and utilities. Project documentation during the construction foundation takes into account the geological environment. (Load bearing capacity of the footing bottom min.0.25 MPa and stable groundwater level is below ground level) and does not address the presence of radon. Project documentation is suitable for construction outside the monument zones. 1.7 Each project house is tied to specific parcel number of building land. 1.8 With one purchased project only one house can be build. 1.9 Project documentation is intended to build on the place specified in the order, especially one consumer. Project documentation cannot be applied to other consumers or to build elsewhere as specified in the order. 1.10 Financial expenses reported in the catalog are informative, depending on the type and price of materials and price realization companies at the time and period. 2.1 The purchase contract under which the Seller shall deliver to Buyer the merchandise is under a binding order of the Buyer, after deposit payment and a written adoption of a binding order by the Seller. Parts of the purchase agreement are the following Terms and Conditions. 2.2 The proposal for this contract is the buyer's order addressed to the Seller. By ordering goods incurred by the Buyer an obligation arises to pay the price of the goods. 2.3.4 via the Internet through online forms on websites: www.eurolineslovakia.sk when it is necessary to accurately and correctly complete all the necessary information (especially phone and e-mail contact) and send the completed order form. In case of any problems in completing the form a free Seller hotline can be used: 0800 135 955, or e-mail info@eurolineslovakia.sk. In all cases, for the goods referred to in 1.2.1 the order will be accepted only after the advance payment for the goods (for rapid processing of orders can be order money slip sent by e-mail or fax), the date of recieving of the advance payment to the seller, or the date of receiving the cash payment. 2.4 By submitting a binding order the buyer confirms that he is aware and expressed agreement with the full text of these GTC and all their parts in force at the moment of transferring orders. To these GTC is buyer sufficiently advised before carrying out orders and has become familiar with them, as well as the price of these products and Buyer agree with them by selecting the "I accept the terms and conditions". 2.5 By submitting an order, the buyer undertakes to accept the goods ordered and paid for the goods agreed price. 2.6 Upon receipt of the order and receipt of advance payment for goods (in 1.2.1) confirms the Seller within 48 hours by e-mail to Buyer adoption orders and advance payments while he notifies the intended date of delivery. All confirmed orders are binding! 3.1 The total purchase price of goods - each type of project documentation, supplementary projects and catalogs are listed in the current offer on the web site of the Seller, in the catalog, in order, as well as in the booking confirmation that the adoption of the proposal for this contract by the Seller. The purchase price always includes VAT and is fixed in Euro. Unless stated otherwise, the price of goods will be charged according to the rates applicable at the time of ordering. 3.4 The total purchase price of goods includes all costs related to vendor project documentation. The price does not include additional changes to the project documentation as desired by the Buyer. Change of the project documentation can be arranged on a separate written agreement between Buyer and Seller. 3.5 The total price of the goods in accordance with paragraph 1.2.1. include the cost of delivery of goods - postage and packing. The total price of the goods in accordance with paragraph 1.2.2. does not include the costs of delivery - postage and packing. 3.6 The tax document (invoice) will send Seller to the Buyer with the goods. 4.1 The term of delivery shall mean the date of dispatch of goods to the purchaser. Term express or super express delivery is valid since the proper ordering and payment of deposit for the goods and the date scheduled for mailing or the date of personal delivery. The possibility of express or super express delivery goods are recommended for the capacity reasons to verify in advance by telephone. Surcharges for express or super express delivery of goods will be settled in the final invoice. For goods - projects marked NEWS the delivery time is 5 weeks. Standard type project of a house from the archive - delivery is 4 weeks - deposit 50% from the current price list of the archive. In projects of additional structures ordered separately is the delivery date that of standard projects and is without deposit. Individual project - for delivery from 4 weeks and in price from 647, - EUR for those who did not choose from a variety of project types of houses Euroline. To obtain more information is needed to write on e-mail: projekt@eurolineslovakia.sk. Dates are subject to availability of capacity in the projection of the Seller. The first two hours of consultation are free. 4.3 For orders of single-family home the Seller delivers complete project documentation in six copies only in paper form (3 copies of the project for the building permit and 3 copies realization project) Total 6 copies. Buyers can order an additional of one copie maximum of building permit project and a maximum of two copies realization project. 4.4 Delivery of project studies and catalogs are 3 business days on delivery and without deposit, by paying in advance on behalf of the Seller are sent without postage. 4.5 Delivery of the goods shall be calculated from the date of receipt of the order and the receipt of an deposit from the buyer to the seller. With the state of the order may be Buyer acquainted through the Free phone of the Seller: 0800 135 955 or inquire by e-mail: info@eurolineslovakia.sk. Remedial date of delivery to the Seller may unilaterally extend in an unforeseeable and unavoidable obstacle (force majeure, strikes, lockouts or render impossible or excessively restricting the transport of goods, damage, destruction due to flood, fire, frost, or illegal activity of a third party, theft of goods). In case of extension of the term of delivery under the preceding sentence is not a breach of the obligations of the Seller and the Seller does not delay the handing over of the goods. 4.6 The Seller shall not be liable for late delivery of ordered goods to the Buyer culpable carrier / post. For damage caused by a fault shipment carrier / post takes full responsibility of the carrier / Post. Such cases dealt Seller delivering new products to the Buyer after payment of all damages carrier / post. 5.1 The Buyer may cancel the order within 24 hours of ordering. 5.2 The buyer has the right to withdraw the relevant provisions of the Civil Code and the Commercial Code. 5.3 The Buyer who is a consumer may withdraw from the contract of sale of goods referred to in paragraph 1.2.2. without giving any reason within 14 days of receipt of goods. The cost of returning the goods shall be prepaid by the Buyer. 5.4 The buyer is not allowed to withdraw from the contract for the supply of goods referred to in paragraph 1.2.1. because the design of the custom orders designed specifically for one consumer - the buyer for the construction of a predefined plot, pursuant to Article 7, paragraph 6, Act no. 102/2014. 5.5 If the buyer insists on withdrawal from the contract for the supply of goods referred to in paragraph 1.2.1 before accepting the goods received by the Seller liquidated damages in the amount of 150, - EUR as compensation for planography work. 5.6 In case the Buyer without legally relevant reason did not accept the merchandise referred to in point 1.2.1 within 30 days after the agreed date of delivery and not written revocation order, the order will be deemed to be canceled. In case of cancellation and reorder of the same item by item 1.2.1 Buyer same or the same land, the Buyer is not entitled to campaign discounts of 24 months. 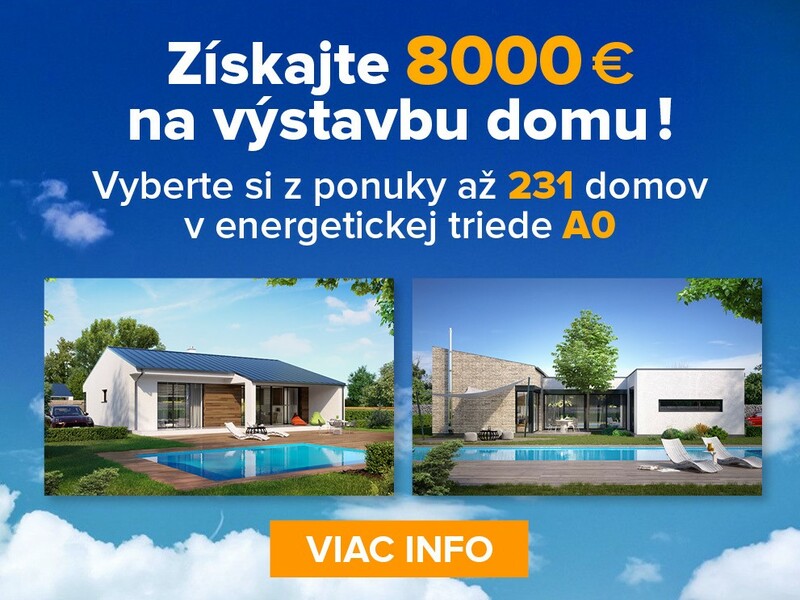 6.1 If the Buyer is eligible holders of home savings contract with the Prva stavebna sporitelna a.s. and receive the goods in accordance with paragraph 1.2.1 5% discount on the purchase price. To apply discounts Buyer must send a copy to the Seller "Client Card" or a copy of the form "confirmation of the contract on building savings" with the design order. No additional discounts are possible. Discount (off VAT) will be in the final invoice. 6.2 The Seller reserves the right to make a variety of special discounts and these are always placed on the web site of the Seller: www.eurolineslovakia.sk, or in printed media and are valid only for the period specified in those media. Special discount rates are valid if within that date the project documentation will be ordered and the entire deposit paid for the goods. 6.3 When special discount is applied any other discounts are not possible to use. 7.1 The seller is responsible for ensuring that the project documentation is prepared in accordance with the general technical requirements for construction. The seller is responsible for defects of the goods at the Buyer's acceptance, as well as defects that occur after receipt of the goods under warranty (warranty). 7.2 The warranty period is 24 months beginning on the date of receipt of the goods by the Buyer. Such warranty is meant by document (invoice and proof of payment). 7.3 The warranty does not cover normal wear and tear of goods (or parts thereof) due to its use. In the event that the Buyer destroyed drawings, has the option to order them separately, or all of sets from the Seller after you enter the Buyer's customer number and drawing number in the symbolic price of 1€, - for each drawing / document + postage. 7.4 The Buyer is obliged to check the goods supplied by the Seller without undue delay and errors encountered notify to the Seller. In the absence of part of the goods (lack of sets, or missing some part of the project documentation) the buyer is obliged to notify the Seller within 3 days of receipt of goods. When identified design errors in project documentation alone, the Buyer shall inform the Seller no later than the end of the warranty period. 7.6 The complaint is required in all cases produce a copy of the invoice and proof of payment and delivery of goods whose defects are claimed. 7.7 Complaints shall not apply to interventions in the project documentation where modification of the legislation after the date of transfer of the goods is induced. 8.1 Project documentation is an expression of architectural work that is protected by copyright. The seller is the copyright owner to architectural works published in order catalog project solutions. The purchase agreement is also the license agreement which entitles the buyer to use architectural work. The buyer has no right to authorize the use of architectural works to a third party or transfer rights under this Agreement to a third party. The rights granted by this Agreement shall apply only to the person who buys, do not pass to the legal successor of the Buyer and may not be transferred to another person without the written consent of the Seller. The license is non-exclusive. Remedies use the work in a manner to which a non-exclusive license granted is not affected, and also does not affect the right vendor to license a third party. Changes in architectural work can be done only with prior written assent of the Supplier. License under this contract shall be for a period of up to approval of the building constructed on the basis of project documentation. Rights of the assignee or other owner of the building will not be affected. The owner or other user of the building, which is an expression of architectural works may be carried out on site without permission of the author only such building modifications and maintenance works, which are necessary to maintain it in good condition and to maintain functional use and which do not reduce the value of architectural work and do not interfere with copyright. 8.3 The Buyer shall be entitled to use the design documentation solely for the transaction of necessary permits for the construction of a single family home at a place specified in the order. In case of violation of this power, the author is entitled to demand a penalty equal to twice the price of the work available on the website at the time and period and for each individual case of breach. The contractual penalty is due within three days from the date of billing. These data are stored in protected databases on our server. These data are also necessary for our accounting and billing system. Whenever when you visit our website the opportunity to enter personal data, please give yourself a set what information you want to provide. Fields that are marked as required, should be completed in order to make your order, or other processing requirements. When paying for goods (the implementation of orders via the Internet on-line form on our web site) are not entering any information that directly related to the work of money on your accounts. All currently proposed forms of electronic banking (payment for goods over the Internet) are made directly to your bank's website, which will provide us only information about the success or failure of payment, your name or account number (so that we can identify the payment and, if necessary, return) . In no case we will never know any further information as your login or your account balance. Your details below, in accordance with applicable laws regarding the protection of personal data, are also used for our own marketing purposes and for information on services for customers. Your personal information is not made available; we do not provide any other entity, with the exception of organizations with which cooperation is essential to the correct execution of your order. These are example. Courier Services (address for delivery). These data are not always given once for the execution of your specific order. We are protecting our database of personal information against damage, destruction, loss or misuse. 9.3 The consent to the processing of personal data. By submitting the order buyer gives the seller in accordance with the Act. 122/2013 Z.z. on the protection of personal data, as amended, consent to the processing of their personal data in order for the purpose of order and delivery, and for a limited period - 10 years. The buyer has the right to withdraw approval in written form to the address of the Seller. Approval shall expire within one month of receipt of the appeal consent of the Buyer to the Seller and the data will then be deleted. Buyer has further rights under § 28 of Act no. 122/2013 Coll., As amended, ie in particular, the right to information about the state of processing of my personal data, the right to a copy of data that are subject to processing, rectification of inaccurate or outdated personal data during processing, the right of disposal of personal data if the purpose was fulfilled their processing. 9.4 The consent to the use of personal data for marketing purposes. Your personal data may be used for marketing purposes of the company. The buyer has the right, by written request, to oppose the use of their personal data for marketing purposes.